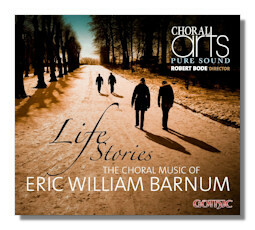 This is a worthy project, the first such disc I'm aware of that is entirely devoted to Eric William Barnum. All of his music is beautiful and sets inventive texts to great music. The Gothic label has long been committed to uncovering new and obscure choral repertoire, and this was a very smart idea. Choral Arts sounds terrific under Robert Bode, and the sound is pleasingly resonant without being swamped. With the exception of Jenny Kiss'd Me – which I found inventive but ultimately annoying – each one of these 11 selections have something to offer. The most famous of these is The Stars Stand Up in (the) Air, which has become somewhat of a hit among choirs of all ages. It's incredibly moving and rises to a shattering climax. Moonlight Music is a Shakespeare text that Barnum doesn't try to get cute with. Instead, he uses some amazing harmonics to bring the text off the page. Each selection testifies to the painstaking care that Director Robert Bode has taken to blend his excellent choir, and each does the composer proud. While the notes are penned by the composer himself, I would have preferred a little more effort to have gone into crediting those involved. Having to go to the back of a booklet to find who the pianist is seems silly and makes documenting Lee D. Thompson contribution seem like an afterthought. Also, Stars Stand Up in Air has a "the" in it, and always has. Issues like these are very minor – and do not ultimately make me less inclined to recommend the disc – but a quality overall product is important. On musical grounds alone, this is a discovery.